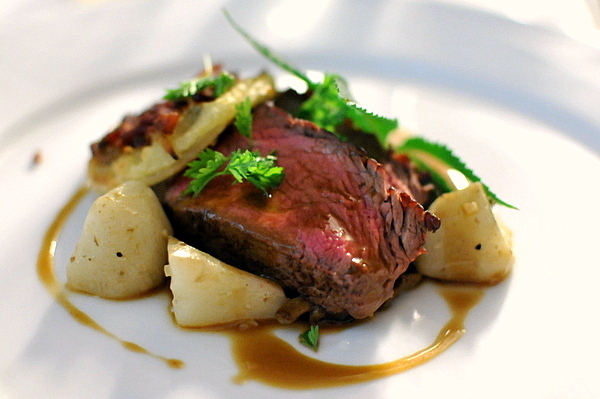 I first learned about the 5x5 dinners back in 2008 when I was starting to get into fine dining. The meals provide an opportunity for some LA's top chefs to work together by taking turns cooking at each other's restaurants. This year's group include veterans: Josiah Citrin(Mélisse), Michael Cimarusti(Providence), and Gino Angelini(Angelini Osteria) as well as newcomers Michael Voltaggio(ink) and Rory Herrmann(Bouchon). The dinners also always feature a sixth guest chef and for the first dinner of 2012 it was none other than Ludo Lefebvre of LudoBites fame. As always a portion of the dinner's proceeds are donated to Special Olympics of Southern California. Typically the meals are spaced about a month apart; the exact dining times are shown below. This was a play on one of Citrin's classic canapes, instead of the pistachio and goat cheese encrusted grape, we have rolled foie gras terrine and rhubarb gelee. This reminded me of a gentrified pb&j, the same savory-sweet interplay but heightened with an offally richness thanks to the foie. 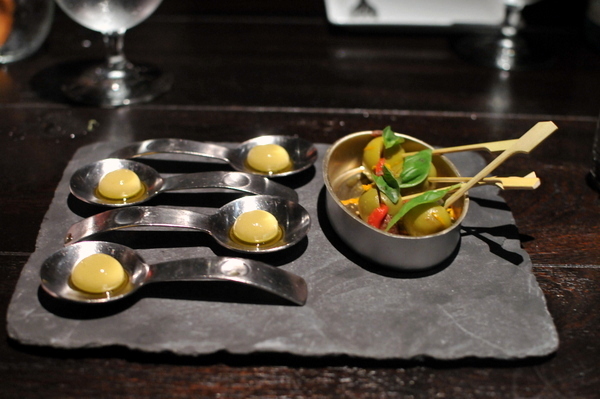 As always the chef from the host restaurant is responsible for the amuse. We were advised to start with the a surprisingly complex shot of pea soup. The Meyer lemon froth and zest opens the dish with a sugary front that fades in favor of the vegetal broth which is enhanced by a sour burst from the yogurt. The chip was equally nuanced with the heady sapor of the chicken skin deftly tempered by the rustic tang of the curd and beets. 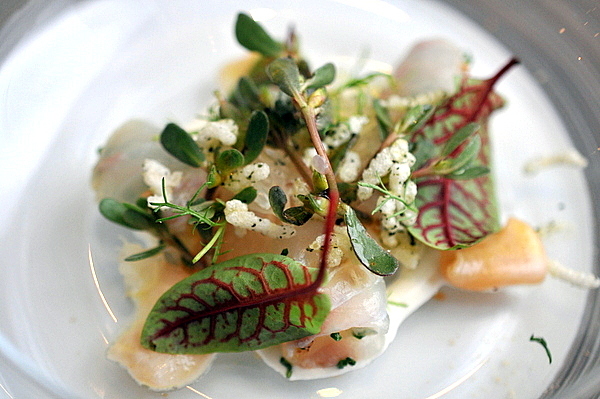 Providence's maestro definitely plays to his strengths with this dish. 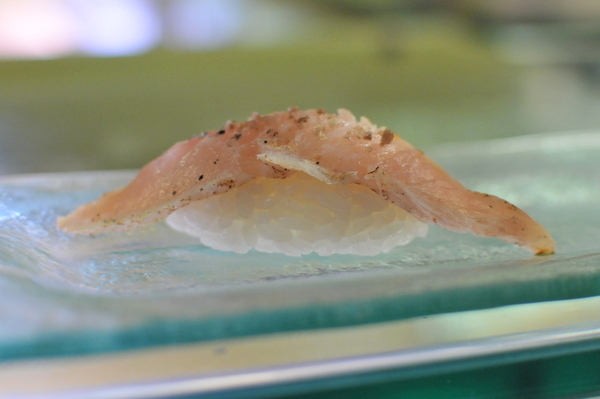 The trio of raw fish shows off some superb textural contrast from the tender fleshy fluke, to the oily suppleness of the engawa, and finishing with a brine-kissed crunch from the clam. I've struggled pairing raw fish with creamy accompaniments but I found the weight of the crème fraîche to be a very comfortable accompaniment as was the seaweed-tinged savor of the puffed rice. 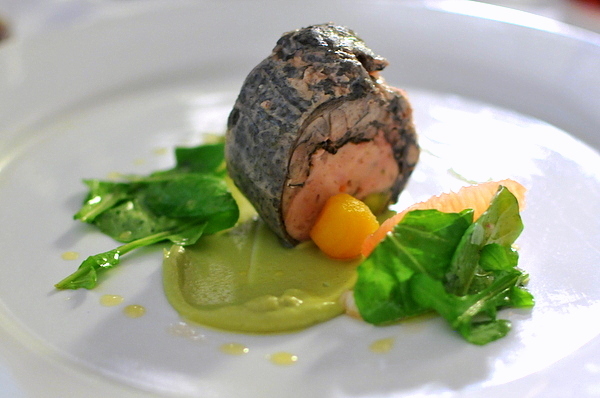 With bold cerebral contrasts of flavor and textures, this dish was straight up Ludo. 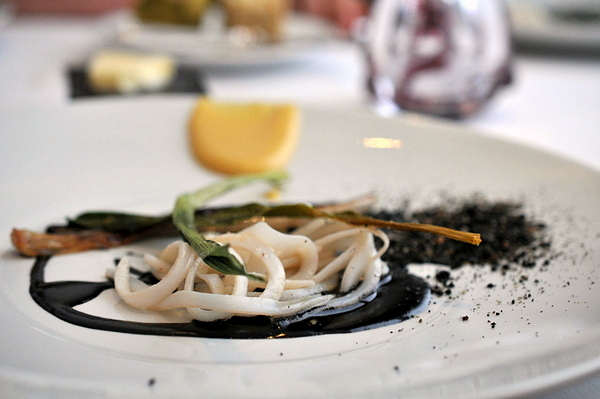 The squid noodles have a gentle salinity that pairs well with the aromatic char of the leeks and ash. The creamy miso provides a funky sweetness that cuts through the bitter elements on the plate. Sometimes the simplest dishes are the most effective. 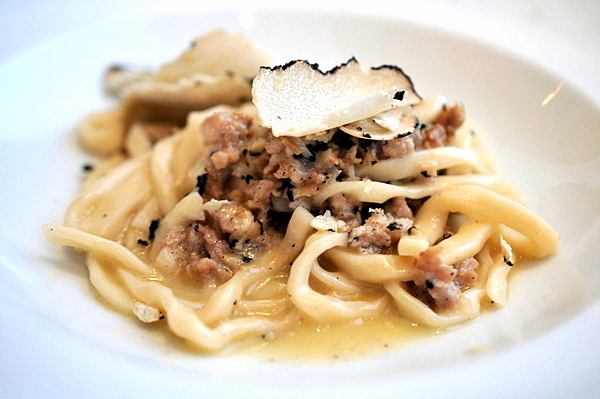 Angelini is rightly known for his handmade pasts and the spaghetti certainly does his reputation justice; especially dense but still has the perfect al dente toothsomeness. The resulting dish isn't going to win any awards for innovation, but its hard to discount the allure of luxurious truffles coupled with the meaty twang of the meat and cheese. I was a bit wary about the slightness of the fish but the bass proved to be one of the night's standouts. 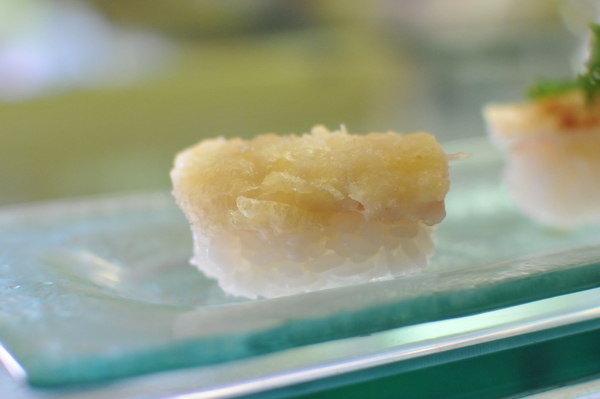 The exterior of the fish exhibited a rough crispness though the core remained flaky and moist. The fish had an unexpected savory gravitas that was augmented by the umami relish of the earthy broth. 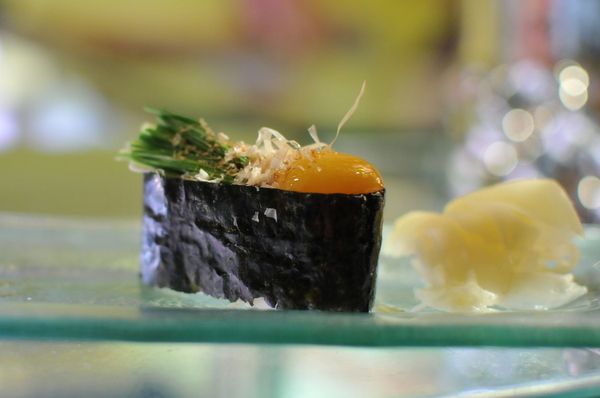 The egg dumplings were actually made entirely from egg yolk and reminded me of a slightly dense scrambled egg. The center remained a touch runny and I appreciated the emulsifying effect it had on the broth. Everything on the plate had a purpose, even the grass which contributed a lively succulent crunch. 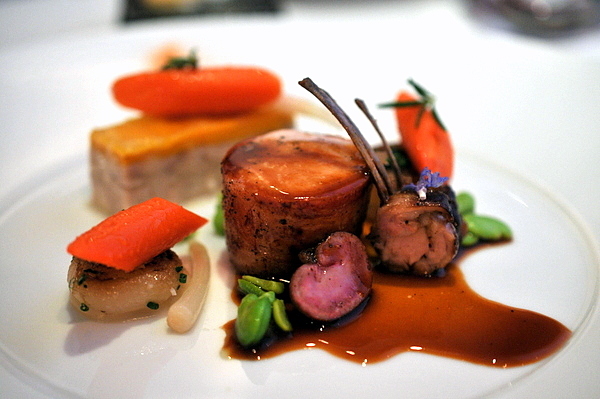 The final dish of the night was a trio of rabbit: loin, rack, and moussé. Though not a traditional mirepoix, the beans, carrots, and onions felt like a natural if generic accompaniment to the meat. 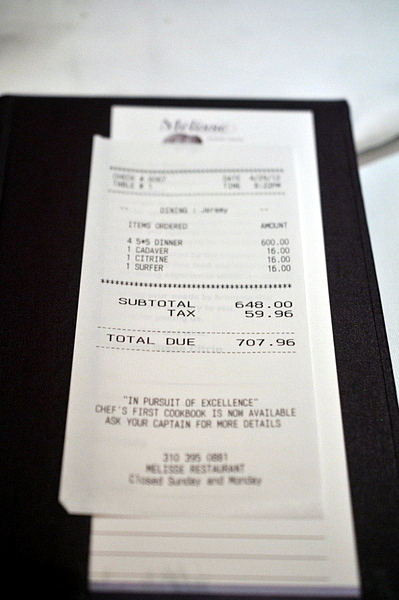 Tasty but a bit blunt, I couldn't help but compare this to the rabbit at French Laundry. 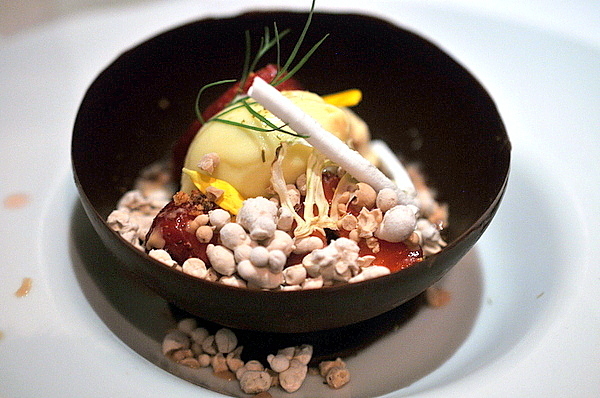 Dessert is also the purview of the hosting restaurant. In this case Mélisse's CdC Ken Takayama dusted off his pastry experience to create a dessert both whimsical yet approachable. At the center of the chocolate bowl was a fudgy chocolate cake with strawberries. Over the top the staff poured a sugary strawberry puree as well as nitro caramel dippin' dots which when melted merged seamlessly with the puree. The wild fennel provides a subtly elegant touch of herbaceousness to the otherwise straightforward yet delicious combination. I've been to a number of 5x5s in the past and the chefs always seem to step up their game for the event. I've always found the 5x5 dinners to be a brilliant concept; the chefs genuinely seem to have a good time and diners get to conveniently sample some of LA's top chefs while supporting a worthy cause. Though my first trip to The Bazaar proved to be a disappointment, subsequent visits have been much more impressive. This latest visit was prompted by visit from my cousin; something of a foodie himself, wanted try a style of food he couldn't easily find back home. 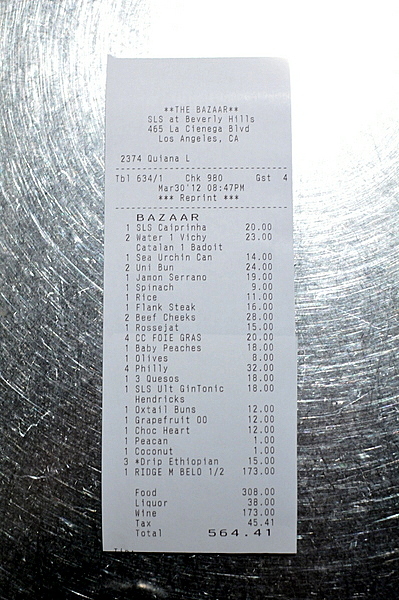 The Bazaar was the ideal choice, modernist cuisine aside, the whole experience smacked of douchebaggery that appealed to his sense of conspicuous consumerism. 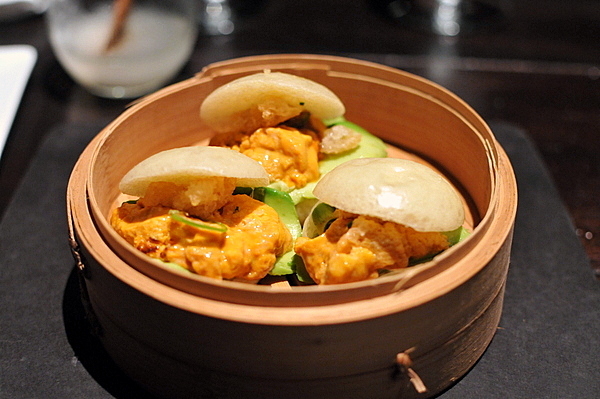 The freshly steamed bao are filled to the brim with seductively sweet uni and creamy avocado and had that been it, the dish still would have been delicious. The addition of a small sliver of chili really sets things off with just the right amount of burn. My cousin enjoyed these so much that he got a second order and I had to talk him out of a third. 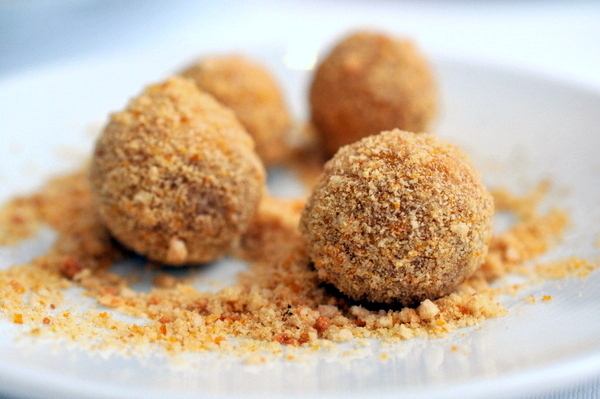 This dish juxtaposes a classic stuffed olive with a liquid version. The true olive has a deeper more nuanced flavor, but the simple salty funk of the liquid olive has more panache. 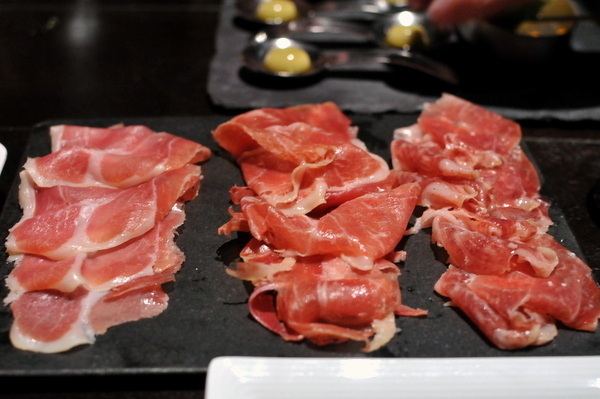 The hams included Serrano, Iberico, and the prized Iberico de Bellota. All three were delicious but the Iberico de Bellota was the clear winner with its glistening oily texture and acorn-fed sweetness. The ham came with a side of toast topped with sweet tomato that was equally delicious on its own or as a countervailing weight to the saltiness of the meat. The cheese was a natural pair with the ham. 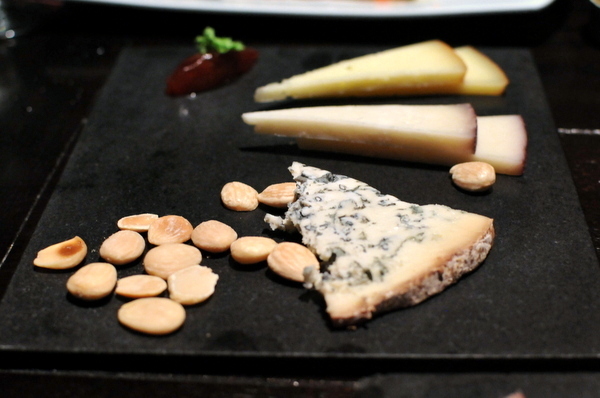 The Murcia al vino and Idiazábal weren't particularly noteworthy, by comparison the savory funk of the Valdeón clearly made the blue the most impressive of the trio. The more robust flavor of the Valdeón also made for a better pair with the jammy quince paste. Despite its humble ingredients this has consistently been one of my favorite dishes at the Bazaar. The crisp sauteed spinach has a resounding savoriness which contrasts nicely with the sweetness of the apple and raisins; a simple combination but irresistible. Another well-received dish, the cheeks are lusciously tender with rich marbling and a heady beefy sapor. 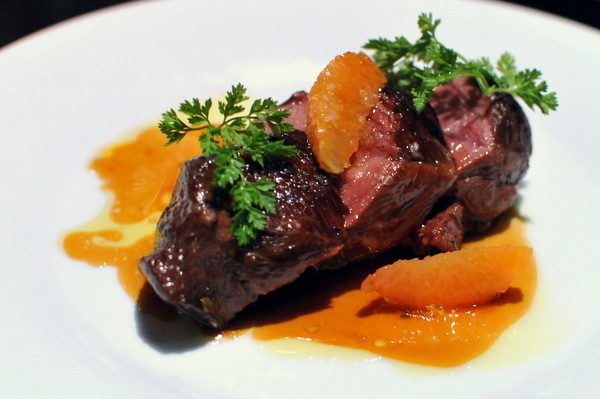 The citrus is perfectly balanced, providing sweet relief without overshadowing the beef. A much leaner beef than I was expecting but with a rich meaty tang. The texture was a bit tougher than I was expecting but the added fat helped matters somewhat. 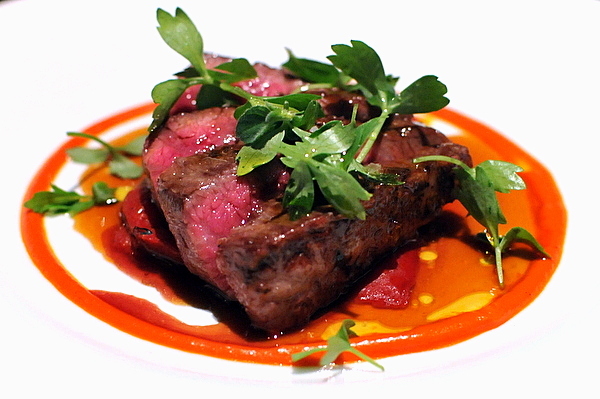 The piquillo added a fitting smoky accent to the beef while the greens helped balance the dish with a gentle bitterness. This dish is reminiscent of a mushroom risotto, the rice conveys the familiar earthy sapor and pungency of the cheese, but without the creamy weight of a traditional risotto. The paella was the only real miss of the night. Though I enjoyed the shellfish tinged brine it was just laid on way too intensely to the point that the noodles were almost inedible. The garlic sauce didn't help matters much by adding even more flavor to something that was already over seasoned. This has been one of my favorites since tried it when the restaurant first opened. Cracking the toasty crust of the air bread releases the salty smack of cheddar in an intense creamy rush with the beef serving as more of a textural element. 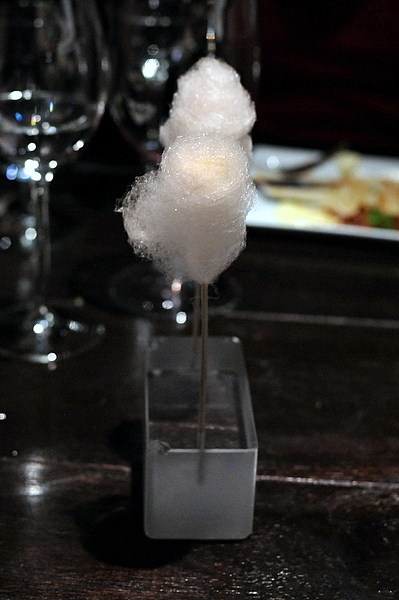 Though the name has changed, perhaps to avoid controversy, the dish remains the same: a rich core of foie gras surrounded by a sticky wrapper of cotton candy. This savory sweet adult lollipop got appreciative murmurs all around the table. I've always loved this dish. The tiny green peaches are deceptively sweet while the buratta, nuts, and arugula make for a delightful little salad and a dusting of a little rock salt brings the whole dish together. With the party not quite full yet I decided to order another set of the steamed buns that seemed to be so popular. 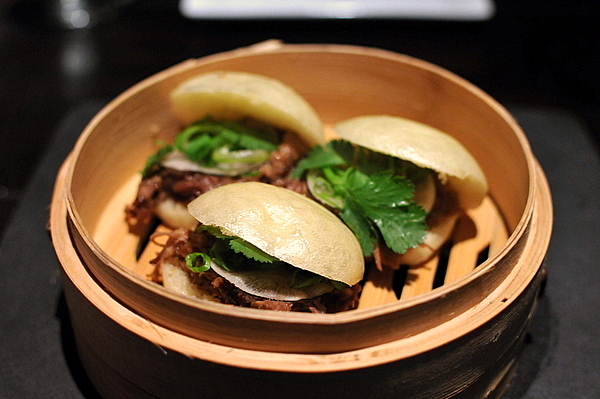 This turned out to be startlingly similar to Chinese braised beef with cilantro and the bao completing the illusion. Despite his adventurousness when it came to savories, my cousin was surprisingly conservative in his dessert choice. 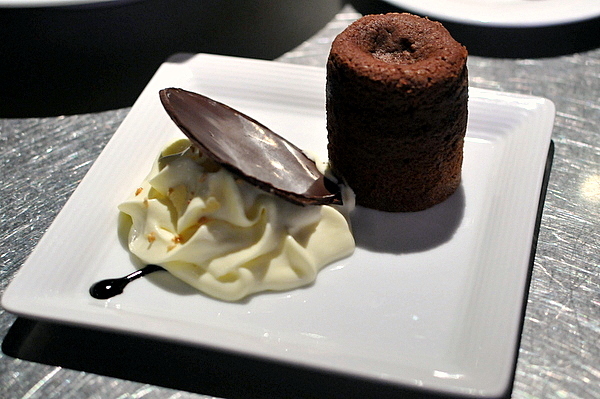 Basically a molten chocolate cake with the complimentary zing of the cardamom. I opted for a lighter dessert. 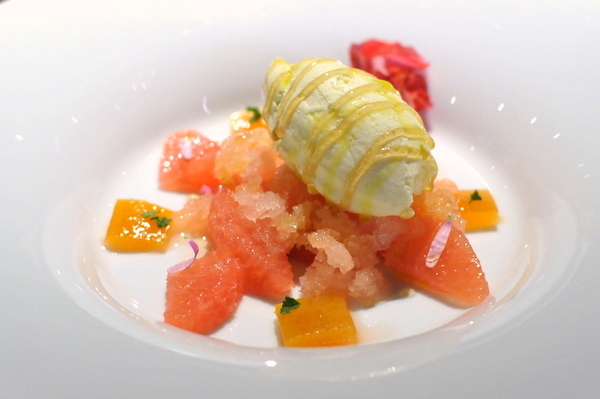 Starting with an enigmatically savory sweet ice cream, the dish adds complexity through a melange of grapefruit and gentle accents of mint. 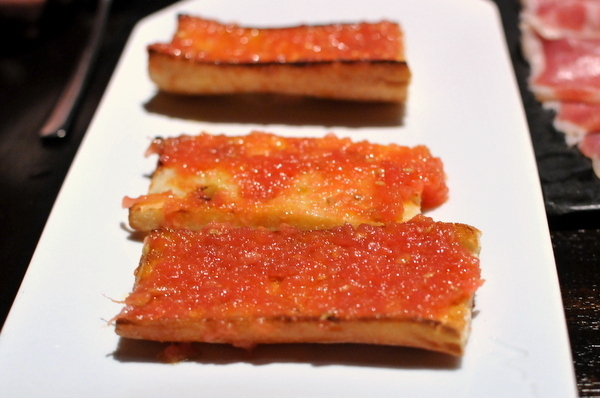 Three years on, the food at the Bazaar remains solid, a good mix of classic tapas along with the contemporary touches that José Andrés is rightly known for. 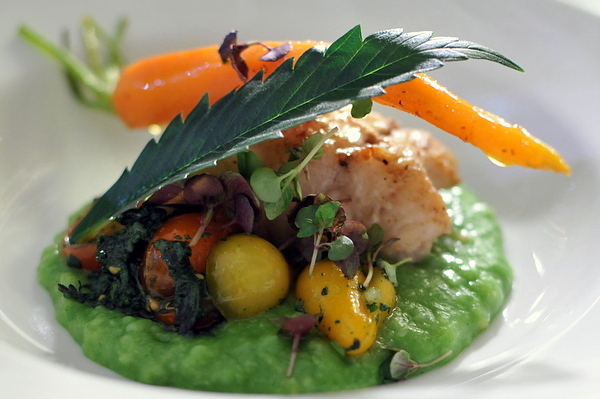 What better way to celebrate 4/20 than with an "herb" dinner. This was actually the second in the series but felt more apropos because of the date. The dinner continues the successful collaboration between Laurent Quenioux and Thi and Nguyen Tran of Starry Kitchen fame. 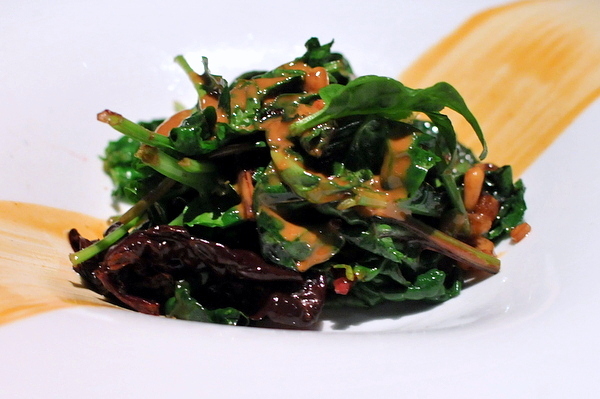 Despite all the secrecy and cloak-and-dagger theatrics there was actually relatively little cannabis with most of the courses featuring "Chinese herbs" instead. For those who don't see the bird as a pet, Silkie Bantams are prized for their flavor and firm lean flesh. That texture is a bit lost on in the spongy core, but the "cap" of chicken still exhibits the delightful toothsomeness that the breed is known for. 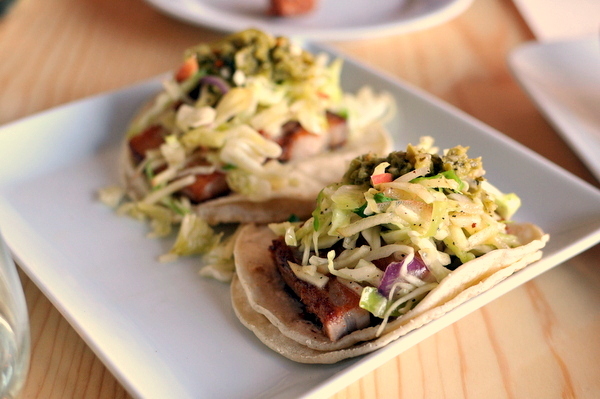 The creamy guacamole is laced with plenty of citric tang which compliments the gentle savor of the meat nicely. This was my favorite course of the night. 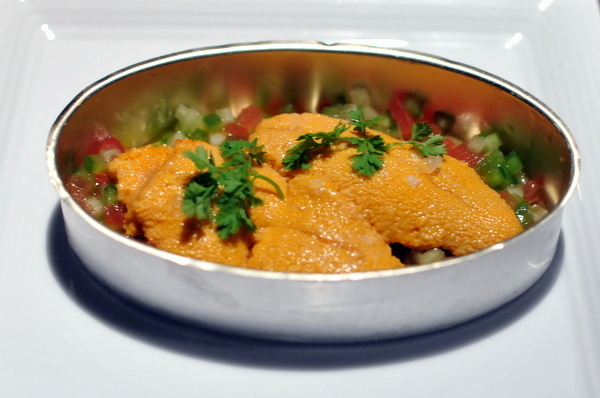 The cooking on the fish is spot on: moist, pliant, and muscular texturally with an aromatic butteriness. 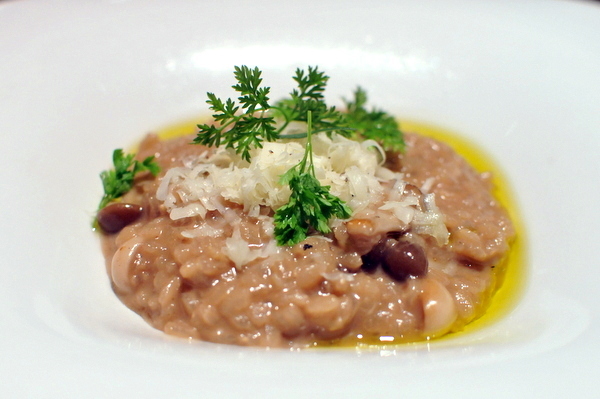 The succulent tomatoes add a tingling sweetness, but it is the congee that provides most of the flavor thanks to the distinctive herbaceousness of the pesto as well as a palpable tingle of spice. The culotte or top sirloin cap tends to be a tougher cut and though the meat was well cooked, it sat too long before serving. The result is a lukewarm slightly congealed texture. 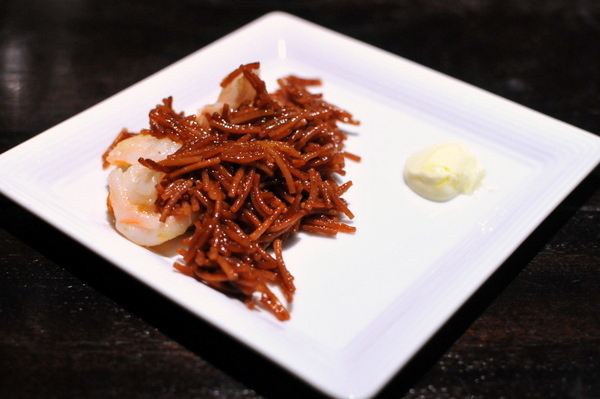 The accompaniments were enjoyable particularly the lightly pickled tang of the Nameko mushrooms. A solid dish, this could have been excellent if it were served promptly. The cocktail was something of an adventure, raw gin cut with an intensely savory smoke that reminded me of bacon or smoked fish. There was so much on the plate that I didn't even know where to begin. 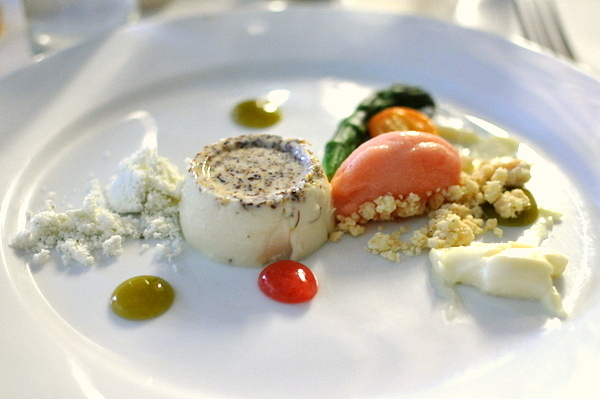 By and large the elements on the plate were enjoyable enough individually, particularly the panna cotta. However taken all together it was difficult to see how all the pieces fit together. The asparagus was the oddest inclusion and judging from the reactions at our table I wasn't alone in this opinion. I think Laurent has been working wonders ever since partnered with the Starry Kitchen team and while the food here exemplified the strengths of their partnership but I think the overall experience left something to be desired. Where the first "herb dinner" had 30 diners, this time around the team served 105 and the result was a banquet-style meal with people packed cheek to jowl. To be fair most people appreciated the communal atmosphere, but with so many diners the unavoidable delay between plating and service meant dishes tended to come slightly cold. I appreciated the creativity and effective use of unique "herbs" but the mechanics of the meal could have been a bit better. For a restaurant opened less than 2 two months, Eric Park's Black Hogg has made quite a name for itself and its blend of heavier Old World cuisine with lighter New World flourishes. The restaurant is so new they have yet to secure their liquor license so BYOB is a must until this is remedied. 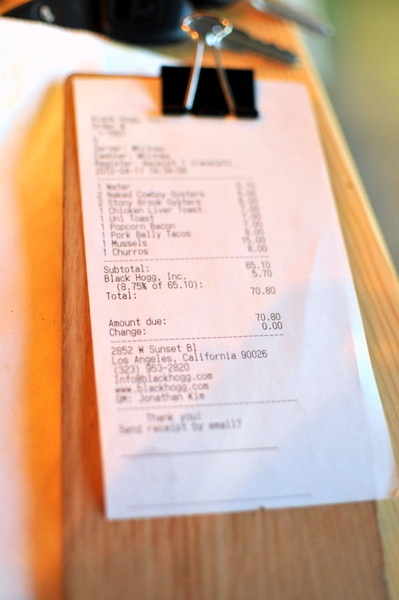 I'll be the first to admit I knew little of Park, though the LA native ran a local sandwich shop for 10 years. His first forays into more serious cooking took place in New York, with formal training at the French Culinary Institute as well as stints at Eleven Madison Park and more importantly The Spotted Pig. 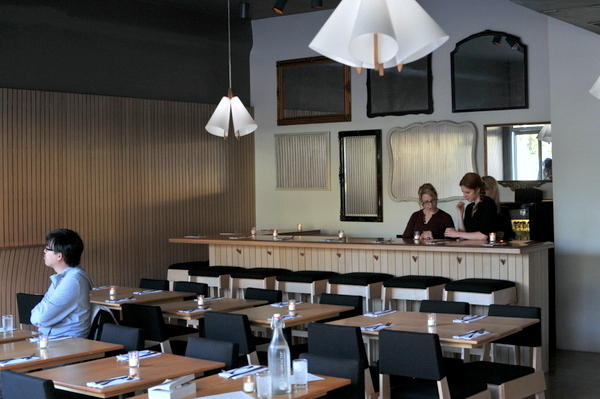 It seems Park took his experience at the latter restaurant to heart, when designing his own modern gastropub. 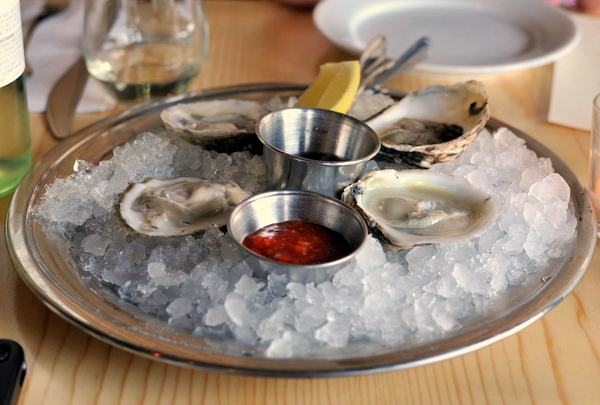 Both types of oysters were from the Blue Island Shellfish company in New York. The Naked Cowboy Oysters were named for Robert Burck, a street performer from NYC, deliciously plump with a slightly funky salinity. The Stony Brooks began with a salty tang that transitioned to a delightfully sweet finish. I've heard that Park cures and smokes his own bacon and the rewards are well worth the effort. The "bacon" is reminiscent of a perfectly braised pork belly intertwining succulent flavorful lean meat with heart stopping rendered fat. 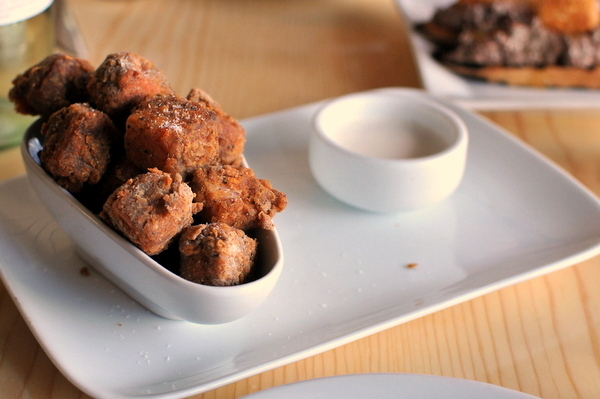 The salty batter surrounding the porcine treasure has a light peppery kick reminiscent of BK chicken tenders. Naturally the delicious cuboids are on the heavy side but a dip in the hauntingly sweet maple crema fixes that right up. 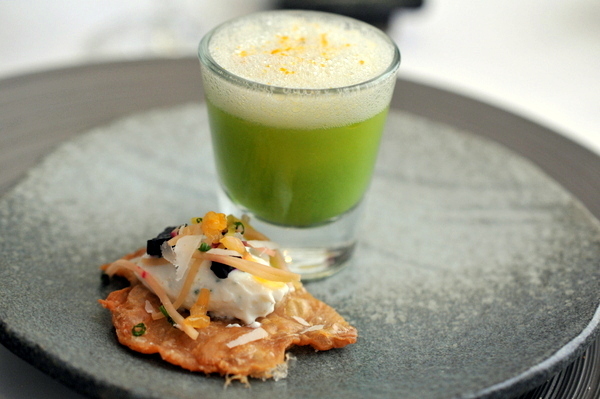 This looks suspiciously like the amuse Ludo served during 8.0 though Park's blog references Animal and Pizzeria Mozza as his inspirations for this dish. 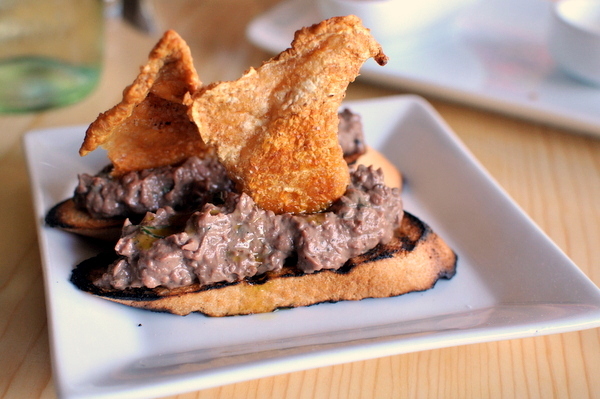 The creamy chicken liver possesses the characteristic offal-y tang enlivened by a racy spicy verve. The cracklin offers a potent salty kick while the soft toast helps restrain the overall intensity. I had high expectations for this course and for the most part it didn't disappoint. The uni did have a hint of bitterness on the finish but the bold accompaniments of scallion and sesame more than made up for it. 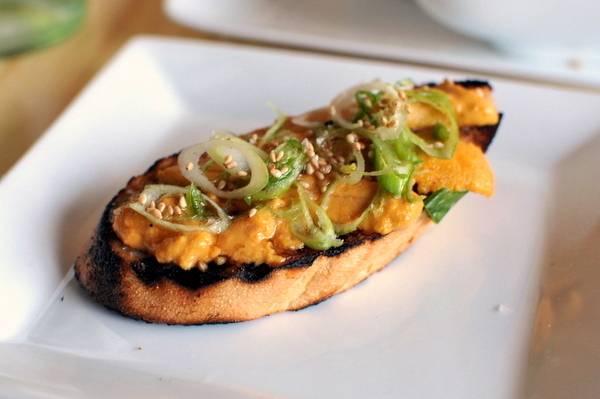 Like the previous course I appreciated the way the bread added some substance to the quivering mass of urchin roe. After the popcorn bacon I was eager to get my hands more of Park's pork. The richness of the belly is apparent but well balanced with broad strokes of acidity and spice from the slaw and relish. I've never been a mussels fan but the inclusion of more bacon won me over. 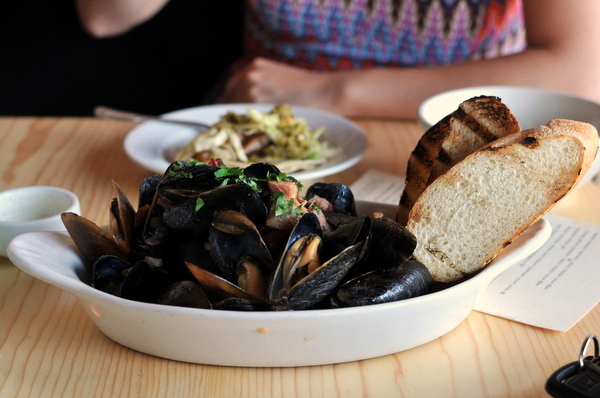 The mussels themselves were plump, tender, and carried a faint salinity. The bacon itself was also quite mild, but the heady broth was redolent with its smoky salty smack as well as rich aromas of butter. 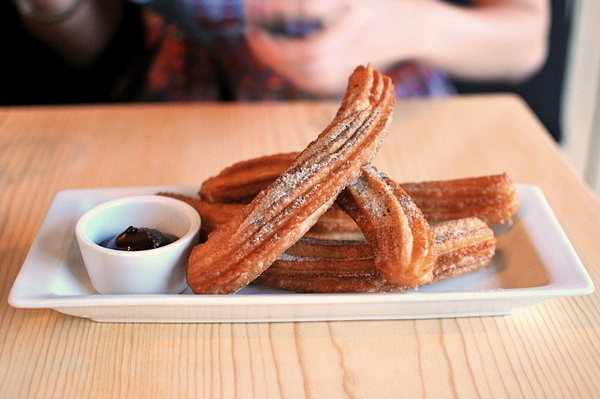 The restaurant's lone dessert is a plate of freshly fried churros flavored with the fragrance of chai to give the dessert some distinctiveness. The crisp fluffy pastry was so good alone that I didn't even need the ganache dipping sauce. Rich and robust are the watchwords of the day when it comes to Park's cooking, but the food is not without some finesse as well. The result is a menu that appeals to those who favor indulgent meat-centric "dude food" as well as those who appreciate a bit of subtlety and balance. 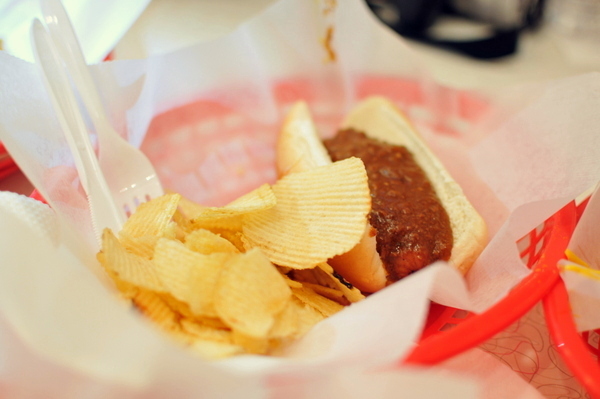 I first learned about Ben's Chili Bowl, arguably DC's most iconic restaurant, from Anne Marler of Komi. She noted that DC didn't have many signature dishes despite being a relatively large city, the only thing that came to mind was the half-smoke; a half-beef, half-pork sausage that, as the name suggests, is frequently smoked. The origin of the half-smoke can be traced to Briggs and Co which started selling the sausages in 1950. Of the many restaurants and carts that serve the local delicacy, Ben's is the most famous. The restaurant was founded on August 22, 1958, by Ben Ali, a Trinidadian immigrant and his wife Virginia Rollins. When the restaurant first opened, DC was still officially segregated and the restaurant quickly became popular with local residents. 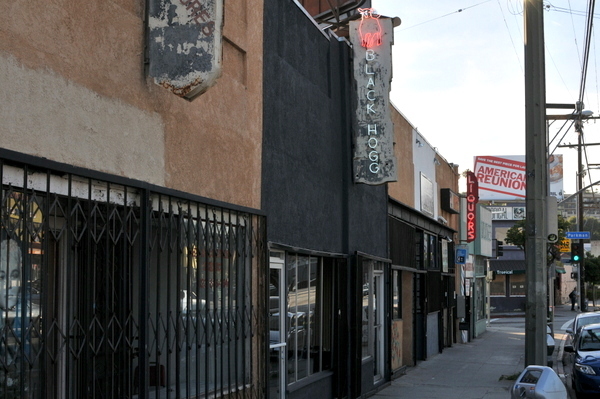 Ben's fortunes have waxed and waned with time, declining after the 1968 riots before picking up again during the early 1990s. Today the restaurant is run by Ben's sons, Kamal and Nizam who also opened a more formal restaurant next door aptly named Ben's Next Door. Naturally this was a must order when visiting Bens. The Half-Smoke is grilled and served on a steamed bun then topped with mustard onion and, of course, Ben's famous chili sauce. The combination of pork and beef gives the sausage a texture that feels dense but supply pliant as well. 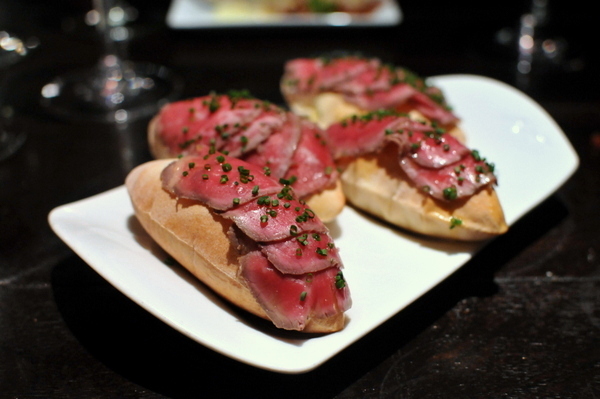 The flavor is an equally exhilarating, nuanced layers of meat tied together with a lingering trace of smoke. The chili finishes things off with a heady richness and a sharp spicy kick. 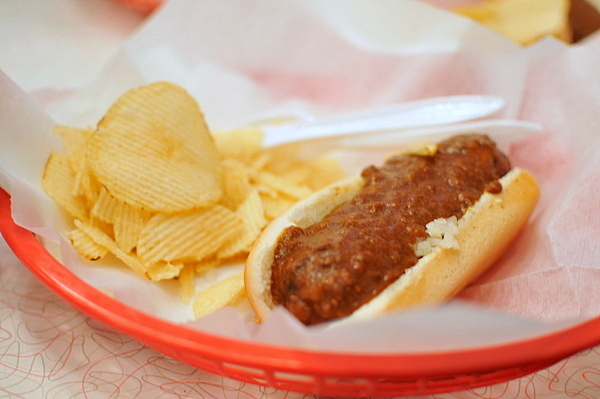 Though a passable chili dog, this couldn't hold a candle to the previous one with both the flavor and texture falling flat in comparison to the Half-Smoke. 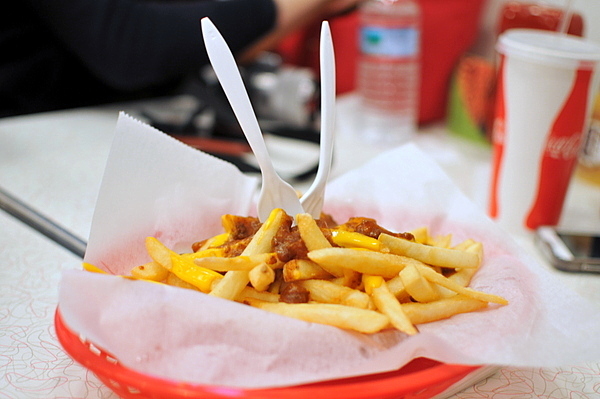 Despite being dubbed "The Works" This was a pretty bare bones chili-cheese fries. Again I enjoyed the way the chili's heat played with the crisp fries and gooey cheese. The food at Ben's is enjoyable but certainly nothing ground breaking. 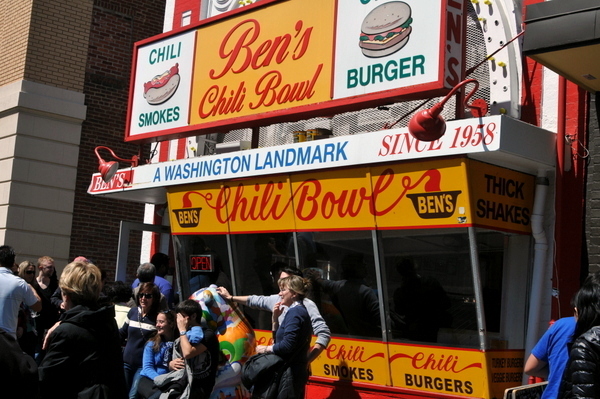 Most restaurants wouldn't warrant the 45 minute wait, but Ben's Chili Bowl is as much a DC landmark as the National Mall or the innumerable museums that dot the city. 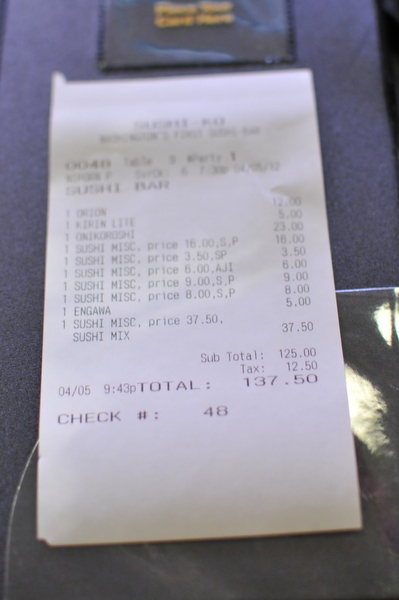 Most debates about DC's top sushi restaurant invariably come down to three choices: Kaz Sushi Bistro, Sushi Taro, and Sushi-Ko. Having been to the first two already I felt obligated to give Ko a try this time around. I opted for the original, Glover Park location, which also has the distinction of being DC's oldest sushi restaurant having first opened November of 1976. Ko's current owner Daisuke Utagawa purchased the restaurant from the original owner in 1988 and has since then built a second more elaborate outpost in Chevy Chase Maryland. I don't know if Utagawa once worked in the kitchen but during my visit, I was taken care of by Sushi-Ko's Executive Chef, Koji Terano. 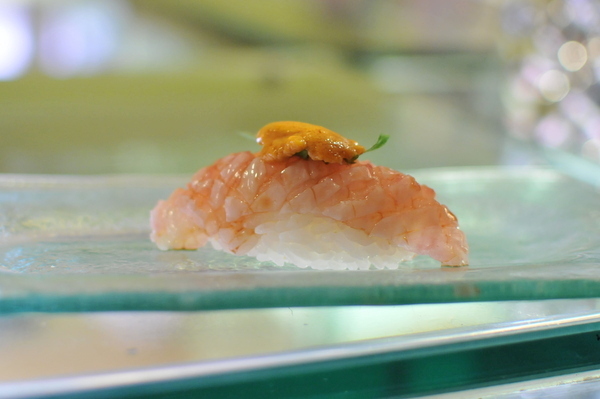 Born and raised in Osaka, Koji started his culinary training at the tender age of 18 at Gorohachi. In March of 1997, Koji responded to an advertisement that brought him to Washington DC and Sushi-Ko where he has made a name for himself over the last 15 years. Interestingly, the other 3 chefs in the restaurant spoke Cantonese to one another and when I mentioned this to Koji he confirmed that he was the only chef of Japanese descent. 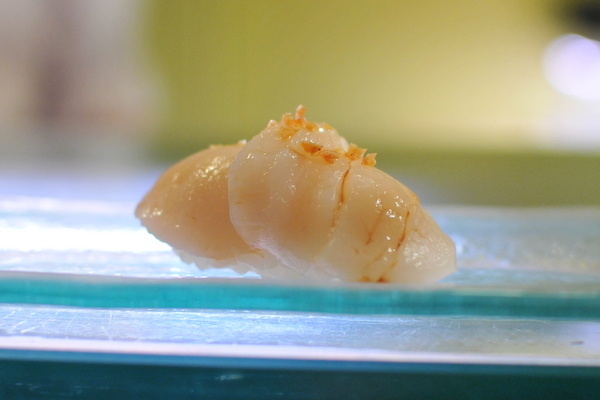 The dense sweet scallop felt a touch dry and came topped with what looked like breadcrumbs; their salty spice was a nice addition to an otherwise been an enjoyable but unremarkable scallop. This is the first time I recall having Sea Trout that wasn't Arctic Char. A very multifaceted fish, there is a bit of snap to the lush flesh and an apparent but not overwhelming fishiness. The mackerel definitely showed the results of being lightly smoked: taut firmness, concentrated salinity, and a fishy smack but much more intense than normal. I don't recall what the topping on this piece was but it had an earthy salinity that contrasted well with the sweetness of the dense chilled lobster. 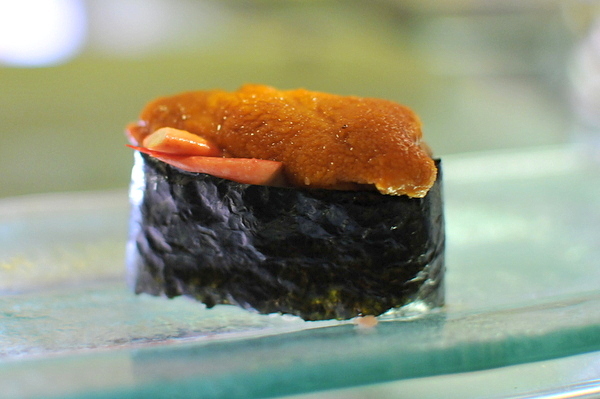 Another of Koji's distinctive lobster nigiri, this time he uses uni to impart the aggressive brine key to tempering the shellfish's inherent flavor. Though the courses up to this point were enjoyable, the quality seemed to improve from this point forward. The Aji was surprisingly rich, and laden with luxurious fish oils. 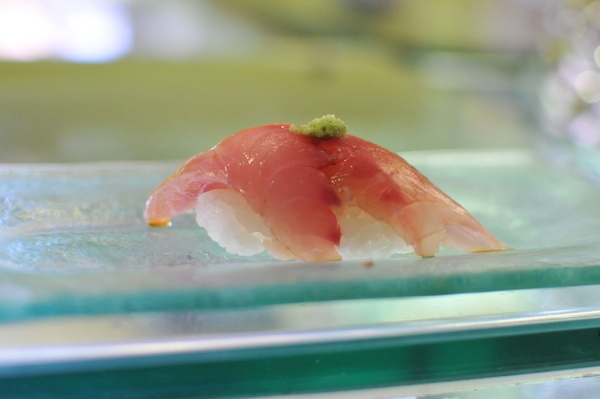 The fish came with a dollop of fresh wasabi on top which conveys a sharp spike of sinus clearing heat. This might be my first experience with seabass belly. 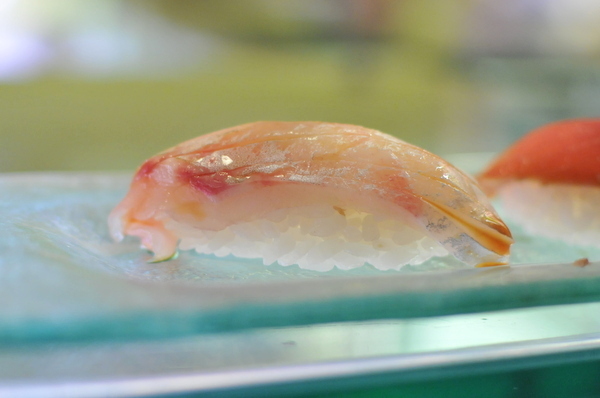 Though the fish is saturated with oil and brine, the texture was more like engawa than toro. I forgot to shoot the Zuke which came with the seabass belly. 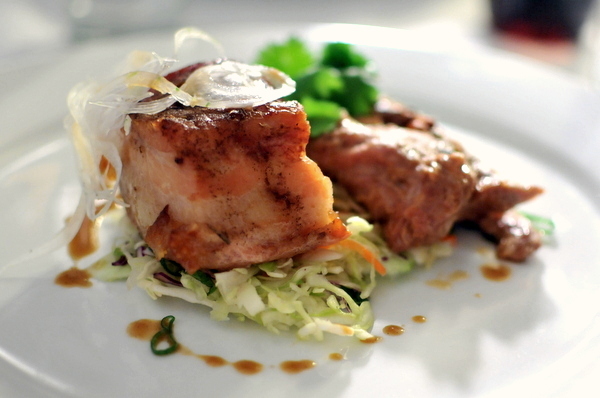 Having had the marinated tuna, the nuances of the Bluefin were much more apparent. 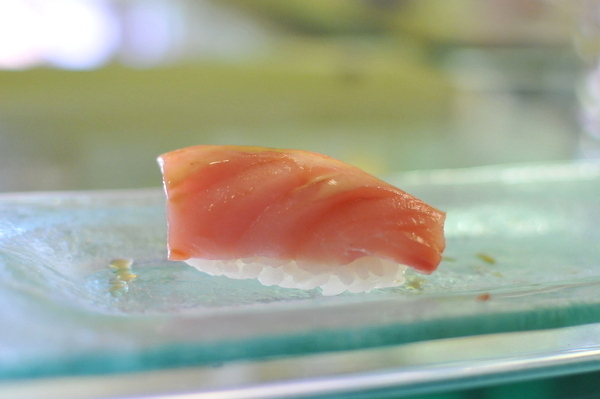 The yellowtail lacked the marbling and patterning I've come to expect from yellowtail; the uniformly tender texture felt quite apt to the featureless surface of the fish. The topping of sesame sauce was intriguing but a bit overwhelming given the delicacy of the fish. 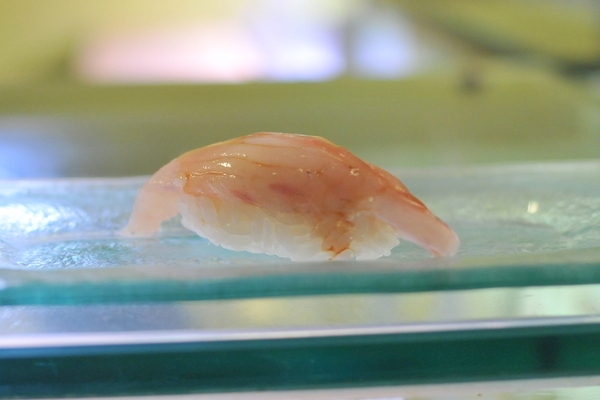 In contrast to the previous piece the yellowtail belly has incredibly intricate marbling. All that fat isn't just for show as the flavor was so intoxicating that I wanted it to linger on my palate longer. The salmon was even more unctuous than the buri. 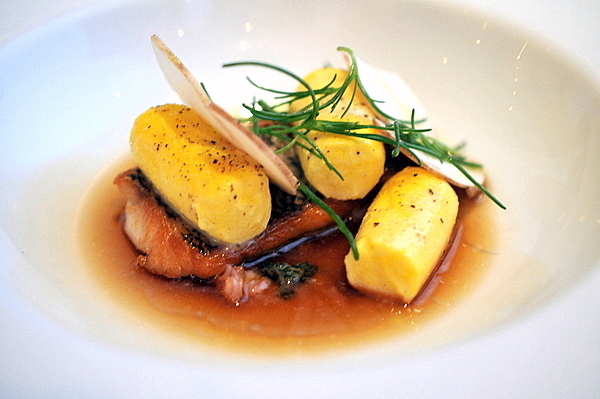 The texture was akin to eating molten fat but the char and sweet onion topping keep the fish from becoming too heavy. 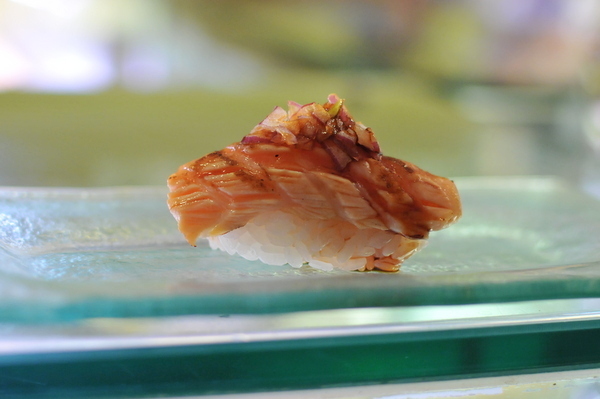 This was one of my favorite pieces of the night, the engawa is ever so lightly seared which gives the flesh a slickness as well as a sinewy bite. 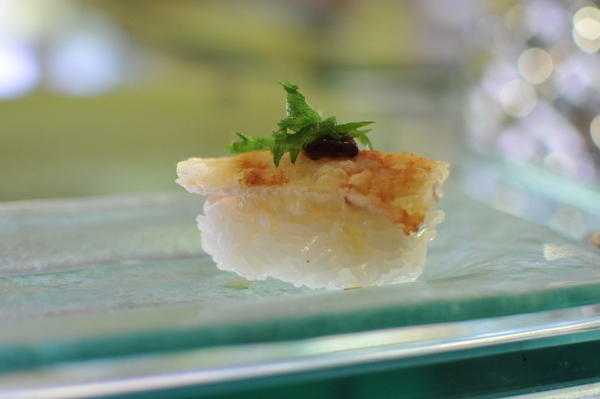 This would have been enjoyable enough on its own but the uni and shiso make the mouthful even more intricate. This is my first time having engawa tempura and I can't say its an improvement. The texture loses its distinctive snappiness, becoming very similar to regular cooked halibut though the subtle fragrance of truffles does compliment the fish quite naturally. Though I preferred the straightforward flavor of the truffle salt, I appreciated the sour funk of the plum and shiso. 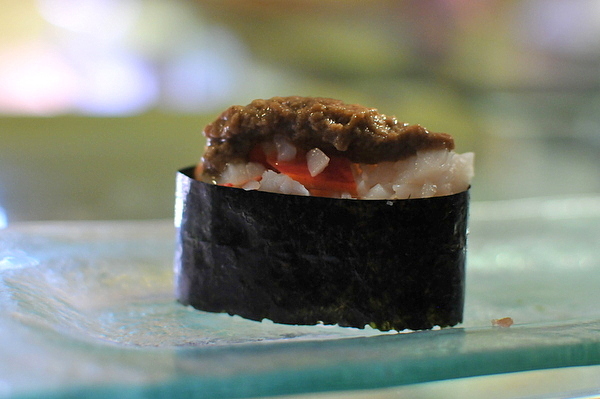 Quintessential toro, melty tender and fairly dripping with heady fish oil. 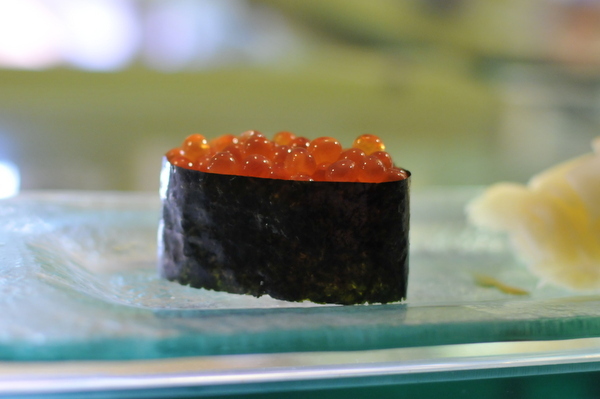 The first piece of sushi I ever ate as a child was Ikura and though I found it challenging at the time I've come to enjoy the cool rush of brine that issues forth when the taut globules burst. Koji saved the big guns for the end of the meal. 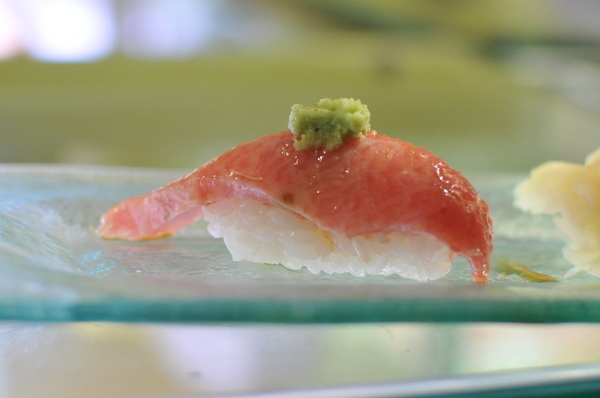 First up a piece of stunning Kama-toro raw with a dollop of fresh wasabi. 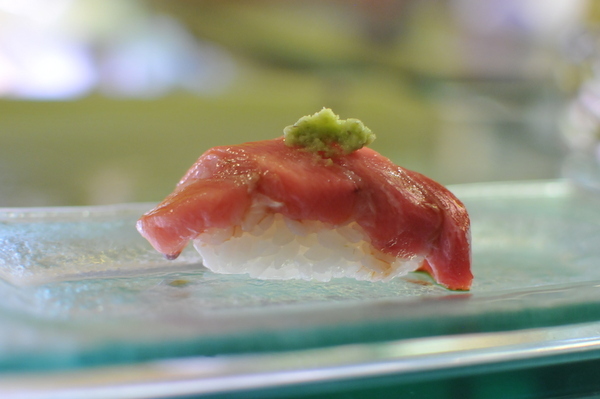 The same rich flavor of regular fatty tuna but with a much more expressive texture. I've never been able to decide definitively whether I prefer seared or raw toro. This was definitely an argument in favor of the seared preparation. The oily fat is pared with a soft gummy texture while the daikon provides a bitter funk to clean all that heft right off the palate. 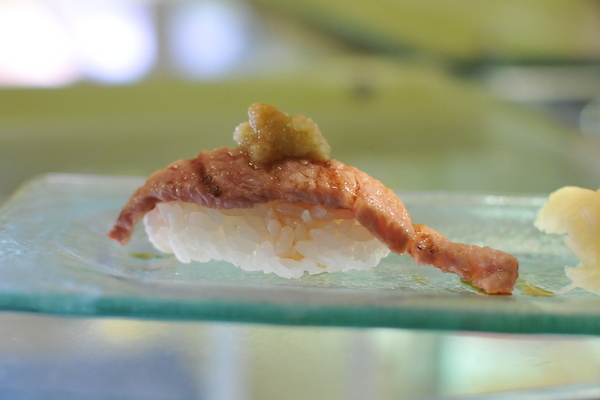 A unique and thoroughly inventive creation of Koji-san's, this gunkan-style roll nicely captures the spirit of spring. The fragrant sprigs of onion play beautifully with the slick egg yolk while the bonito adds just a hint of smoky depth. 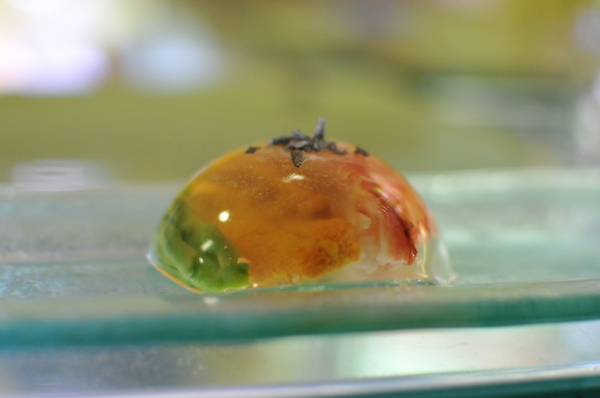 For "dessert" Koji prepared a hemisphere of dashi jello. Encased inside the savory broth was a mix of lobster, uni, and asparagus. 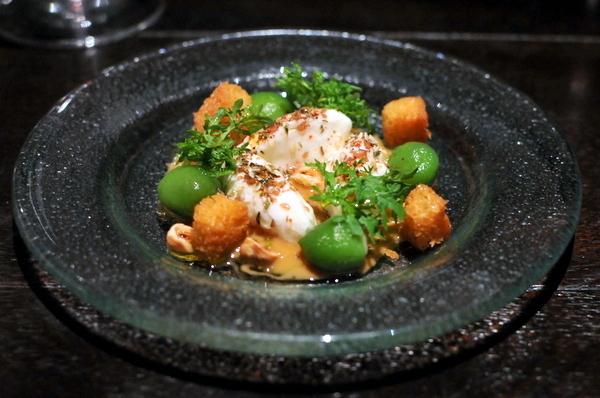 The resulting combination tasted heavily of shellfish with heavy vegetal and umami overtones. The meal got off to a rocky start but improved substantially throughout the evening. I especially appreciated the contemporary twists Koji employs; the young chef is both friendly and talented and though I was eating alone he proved to be good company. Having been to all three of DC's top sushi restaurants I'd have to say my order is Sushi Taro, Kaz Sushi Bistro, then Sushi-Ko; by traditional measures, Taro takes the cake while Kaz does the contemporary sushi thing just a bit better. 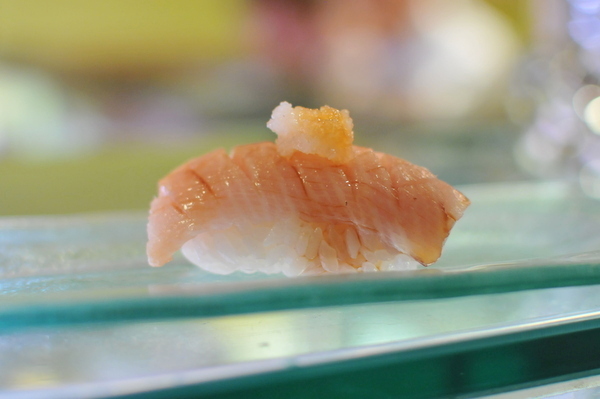 By comparison, the first few pieces of fish at Sushi-Ko felt a touch dry despite having been freshly cut, though that problem faded by the fifth or sixth piece. I know it probably makes me sound like a snob, but my biggest issues were with the rice: just a bit too cold, packed too tightly, and once or twice crunchy and undercooked. Where Ko does stand out is in its accessibility. 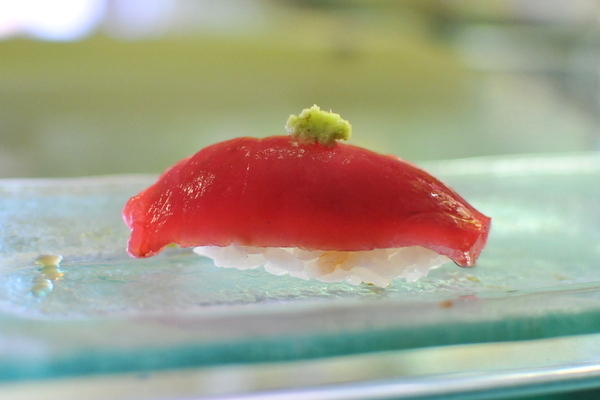 Top sushi restaurants can feel a bit forbidding or intimidating. Ko eschews such affectations, choosing to remain a casual neighborhood spot where both sushi novices and experts alike can get a good meal.